Now in its second edition, this popular and essential comprehensive resource provides a detailed analysis of how to identify, prevent, and manage drug-induced diseases. 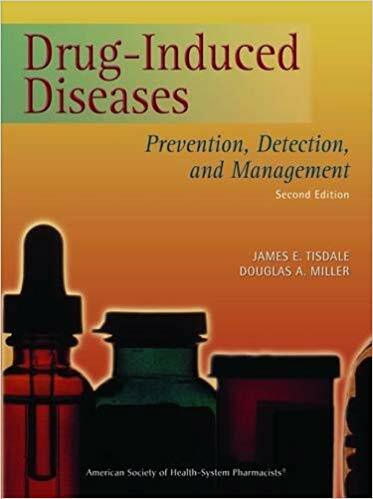 Edited by James E. Tisdale and Douglas A. Miller, with contributions from experts distinguished in their respective specialties, Drug-Induced Diseases is organized logically and is easy to use for pharmacists, physicians, nurses, and pharmacy students alike. Chapters dedicated to each disease state. In-depth tables throughout each chapter. A new section on Drug-Induced dermatologic diseases. New drugs implicated as the cause of specific disease(s). The inclusion of the Levels of Evidence classification scheme for identifying drug-induced diseases. Thank you for your help, but the 2nd edition has already solved my problem, and I need to use the availale coins to buy other books. Thanks again for your help and reply. Thanks, I just receieved a message from the boss that the 3rd edition is also needed, could you provide it to me? I will also pay for it. GMT+8, 2019-4-19 15:26 , Processed in 0.157675 second(s), 28 queries .